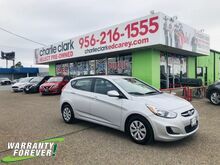 Land a bargain on this 2017 Hyundai Accent SE before someone else takes it home. Comfortable but agile, its tried-and-true Automatic transmission and its strong Regular Unleaded I-4 1.6 L/97 engine have lots of soul for a discount price. It comes equipped with these options: IRONMAN SILVER METALLIC, BLACK, CLOTH SEAT TRIM, Wheels: 14" x 5.0J Steel w/Cover, Urethane Gear Shift Knob, Trip Computer, Transmission: 6-Speed Automatic w/SHIFTRONIC -inc: active ECO system and Hillstart Assist Control, Cruise Control, Torsion Beam Rear Suspension w/Coil Springs, Tires: P175/70TR14, Tailgate/Rear Door Lock Included w/Power Door Locks, and Strut Front Suspension w/Coil Springs. You've done your research, so stop by Charlie Clark Nissan at 3500 W Expressway 83, Harlingen, TX 78550 today to get a deal that no one can beat!